The world of modern aviation is so automated that a possibility of error has been approximated to zero values. But humans are never secured against making a mistake. 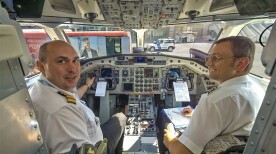 In order to minimize the impact of human factor the pilots must undergo special training with a focus not so much on technical issues as on specifics of interaction between crewmembers in the cockpit including leadership and decision making. FTC offers courses in “Crew Resource Management” for flight and cabin crew members, both initial and recurrent. We have everything to make your dreams come true! International Day of Aviation and Human Space Flight! The representatives of Aviation Company “URGA” took courses at the ICAO Training Institute.